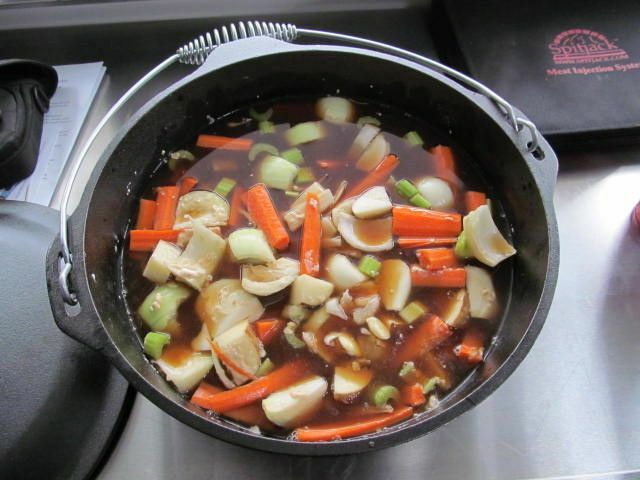 Someone on the Stumps Forum posted a great sounding recipe for pot roast on a Stumps Smoker. 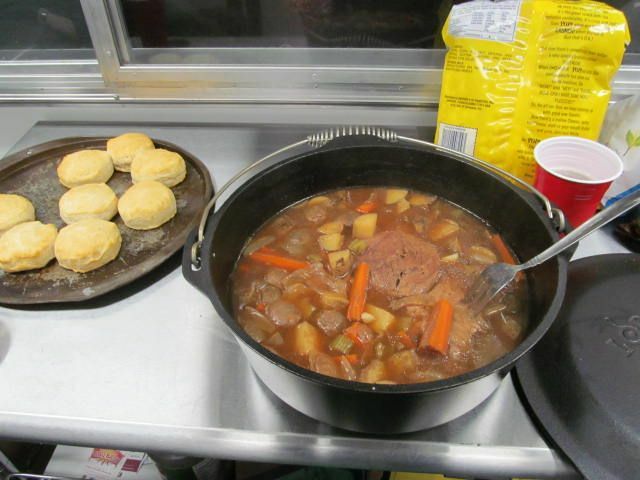 So, I used it as an excuse to buy the 9 quart Lodge Logic Dutch Oven and give it a spin at Nelsonville for dinner on Friday night. 1 Chuck Roast. This was a 3.5 pounder. 2 ribs of celery, diced. 4 large carrots, peeled and diced. Enough beef broth to cover everything. I used 2 quarts. Throw it all in the dutch oven. Cover it up. Put in a 250 F smoker for 6 hours. Pull the dutch oven out of the smoker after 6 hours. Pull the meat apart. After 4 hours I ramped the heat up to 350 F to speed up the cooking. We were getting hungry. After the ramp up, it cooked for 1 hour more, 5 hours total. It was the perfect cold, rainy night dinner. Veggies were still tender and the beef was pull apart good. Use 1/2 cup of flour to thicken a bit more. I also love the dutch oven. Lodge Logic makes a great product for sure. Bill - you said, "Cover it up. Put in a 250 F smoker for 6 hours." Did you put the cover on the dutch oven? If so why then cook it in the smoker?